1st Cooling rents commercial high powered “carpet” fans to assist in drying out water damage. Rental fans are needed from a few days to even months. We are distributors for many vendors of fans so if you would like to buy a fan, call 1st Cooling now at 817-491-0555! 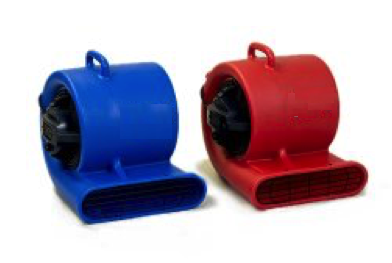 We have large box fans for rent ranging from 36″ to 48″. These are also know as warehouse fans. We have Power Breezers that will cool any outside event. Port-a-cool units are also available for rent. We have a large stock of fans for rent that will fit your specific need. If you have wet carpet take a look at our dehumidifiers that work well with the carpet fans. If you have that nasty wet dog smell in the carpet, we have HEPA air scrubbers, aka negative air machines to eliminate the odor when accompanied with a carbon filter. Air movers are also know as portable industrial fans, turbo blowers, and carpet dryers. There are basically two types of air movers; centrifugal (or turbo) fans and axial fans. Turbo air movers are best suited for blowing air under cabinets after the toekicks have been removed and other low profile areas where the air needs to specifically directed. They are used for drying carpets by creating direct airflow underneath the carpeting with high static pressure. This pressure is enough to easily lift heavy wet carpet. 1st Cooling rents specially designed low-amperage fans. The fans you can purchase at a big box hardware store typically require more amperage per fan. 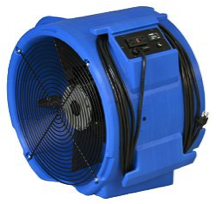 Axial air movers are best suited for top-down drying. This method allows the structure to be completely dried without tearing things up. So carpet, pad, and walls can be dried in place. Their tube-like design and large diameters generate up to 3 times more airflow than turbo air movers. Axial air movers also draw less amps than centrifugal air movers. Most axial air movers can move 3000+ cubic feet of air per minute (cfm) which blows up to 25 feet from the fan. The air flow can be directed towards problematic corners. Dry air prevents moisture invasion problems such as mold and fungi or structural damage. The lightweight and compact low density polyethylene housing that covers the axial air movers is chemical resistant. Call 817-491-0555 now and we will assist in your fan rental. 1st Cooling’s axial fan is powerful, durable, and lightweight and delivers almost 3,500 cfm (cubic feet per minute) of airflow for structural drying yet draws very low amps (2.3Amps). You can string 4 fans together off of a standard 15 Amp circuit using the GFCI receptacle on each fan. 1st Cooling’s centrifugal fan is powerful, durable, and lightweight and delivers almost 1,300 cfm of airflow for structural drying yet draws very low amps. You can connect 4 fans together off of a standard 15 Amp circuit. 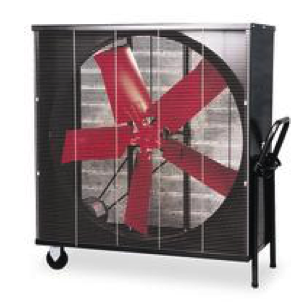 1st Cooling rents classic box or warehouse fans ranging from 36 inches to 48 inches. The fans are useful in large spaces where lots of air needs to be moved.